Yin & Yang, Colours & Monochrome, Left & Right. Balanced. TIP #2 : LIVE LOVE LAUGH Kaka & Shean Wenn sharing a laugh and rolling on the newly laid grass at Sam's house over at the weekend! Last weekend we were invited to Sam's 2nd Birthday held at his parent's house in Northampton. Their backyard boasts a newly laid grass which were so soft! Shean Wenn really enjoyed running around or in the case above, rolling about on the grass. No, it isn't prickly at all. She napped a little on the way there and was recharged so she had a fun time playing with her other little friends : Sam (the birthday boy), Tobey, Bernice, Brandon & Kaka. Halfway we ventured upstairs and Shean Wenn was fascinated by the aquarium. She tried to count fish! Actually she can "count" now, she will go like this "One, two, three, four, seven, eight!!" And then she will rejoice by clapping her hands! TIP #3 : DRIVE A MEAN MACHINE! TIP #4 : DO THE TWIST! 1st photo : SW twirling, twisting & dancing with her friends at Ryan's Full Moon. 2nd & 3rd photos : Tobey showing how you should do the twist! 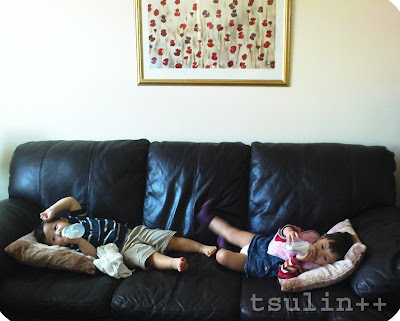 In June, we attended Tobey's 2nd Birthday Party held at their house in Cambridge. The weather was a little chilly but it subsequently became clearer & sunnier as the day progresses. Shean Wenn was pre-occupied with all of Tobey's toys. 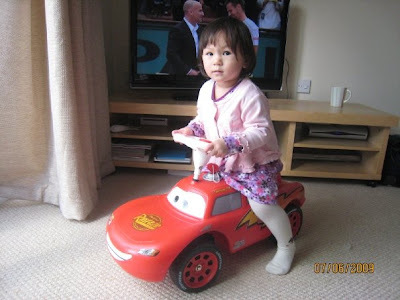 She especially liked Tobey's red car (is it Roary?). These days she is quite fascinated with "driving"- and her sound effects are pretty "thrilling" - she seemed like she is driving pretty fast! Ooooh... perhaps an F1-driver in the making? I have to "tell her" she's "driving too fast. STOP!"Haha.. Yeap! Really fun times, eh! heart the pics! esp the pic where the kids are lying on the grass. Btw-Love the header of the blog. Lyne : Thanks for taking your time to leave a comment here :) The CURRENT blog header is designed by Ros Designs (link on bottom on my blog). I checked out your company website, I reallllly love the decals! Didn't know a Msian supplier that does that. Brilliant!